Need to add a little pizazz to your car? Check out DecalDriveway.com for an easy fix. Make your own car decals, vinyl flame decals, zodiac stickers, car decals and stickers, decal kits, boat graphics, vinyl rolls, tailgate graphics, racing stripes, motorcycle flames, and more. Save on your next purchase from DecalDriveway.com with Decal Driveway discounts, Decal Driveway coupons and Decal Driveway savings from 58Coupons.com. Get your own racing stripes from DecalDriveway.com, now from only $25. Click link to shop. Buy 2 decals from DecalDriveway and you'll save 12%. Click link now. 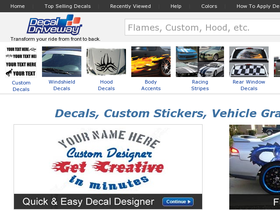 Click link to check out the create your own designs from DecalDriveway.com, now from as low as $6. Buy more, save more with Decal Driveway! You can save up to 30% with their volume discounts. Click link for info.